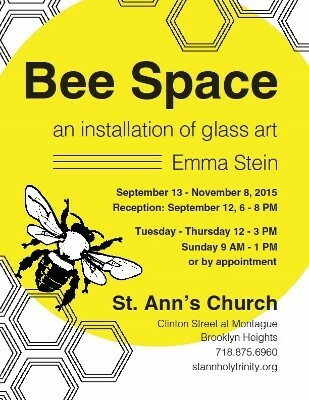 The Forum @ St. Ann’s is presenting Bee Space, an installation of glass art by Emma Stein in the sanctuary of historic St. Ann & the Holy Trinity Church, September 13 – November 8, 2015. The exhibition inaugurates the 2015-16 season of The Forum, which seeks to engage the community in conversation about the arts, ideas and civic life. An artist’s talk and reception was held on Saturday, September 12, 6:00 – 8:00 pm in the church sanctuary. Stein – a glass artist, educator, and new beekeeper – says she is influenced by the beauty of nature, the need to honor plant diversity and bee survival. The artist created two works specifically for St. Ann’s historic landmark sanctuary. “The Hive,” which hangs from the organ loft near the church entrance, is an oversized uninhabited beehive made of clear glass panels. Ephemeral larger-than life clear bees will accompany the centerpiece of the exhibit: a nine-foot relief panel made of dozens of glass flowers in the pattern of a rose window to be mounted behind the high altar. The flowers represent species that are being supplanted by our mono-crop culture, causing the destruction of our bee populations. The work is a celebration of the beauty of our diverse natural world. Stein lives and works in New Jersey. She earned an MFA in glass from Rhode Island School of Design and a BFA at Alfred University. She has taught glass at the John Michael Kohler Art Center in Wisconsin, Urban Glass in NYC, Ox-Bow in Michigan and currently works at GlassRoots in Newark, NJ. She has been awarded a residency at The Corning Museum of Glass Studios this fall, where she will further explore the theme of rose windows she initiated at the St. Ann’s show. She started blowing glass at the age of fourteen and has been passionate about the material ever since while also experimenting with numerous other media, such as fibers, drawing, plants. She draws inspiration primarily from the natural world, and has recently become intrigued by honeybees and the impact they have on our environment. Bee Space will be on display for public viewing Tuesday through Thursday, 12 noon – 3:00 pm; Sunday 9:00 am – 1:00 pm; or by arrangement by contacting office@stannholytrinity.org or 718-875-6960. In the 2015-2016 program year, which Bee Space helps to launch, The Forum @ St. Ann’s will host other art exhibitions as well as film screenings, poetry and book readings, panel discussions and concerts that build on the success of 19 previously well-received events mounted since 2012. See photos of Emma Stein’s glass art plus the opening artist’s talk and reception here.